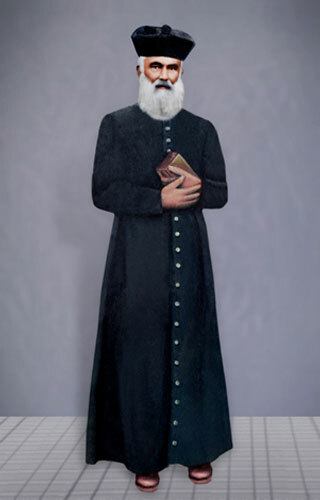 Rev.Fr.Joseph Louis Ravel, the Founder of the Congregation of the Franciscan Sisters of the Presentation of Mary was born on 24th August 1824 at Valeren, France, in a family of landlords. Rev.Fr.Ravel grew up in an aura of deep spirituality and entered the Major Seminary of Foreign Missions. He was ordained as a Catholic Priest on 17th June 1848. Rev Fr.Ravel's deep compassion, unflinching faith, benevolence and intelligence made him take up a missionary assignment with the M.E.P. Priests at Coimbatore, with Karumathampatti as its headquarters. Undaunted by the illiteracy, ignorance, intolerance and bigotry that he found among the people, Fr.Ravel worked relentlessly, identifying himself with them acquiring their language and culture. A presbytery, a church at Wellington, the Church of Our Lady of Rosary at Karumathampatti are the fruits of his apostolic labour. Care for the sick, education of women and fighting the evils of casteism were concerns close to his heart. Gradually his selfless service inspired him to establish the Congregation of Franciscan Sisters of the Presentation of Mary in 1863. Savariammal, an uneducated village girl from Karumathampatti was the first postulant of this new congregation. Through her and many others like her,Fr. Ravel succeeded in inculcating the great Law of Charity in the society. "To live as the living teaching of the great law of charity, which is the true foundation and beautiful summary of the Christian religion".